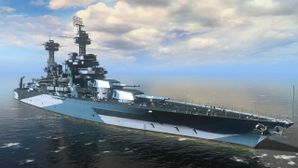 W. Virginia 1941 — American promo premium Tier VI battleship. One of the Colorado-class battleships. She developed low speed, was equipped with 406 mm main battery guns and armored according to the all-or-nothing scheme with the maximum possible protection of the vital parts of the ship. W. Virginia 1941 is quite similar to her tech-tree sister, Colorado. Armed with the same set of eight 16" guns, tough armor, and sluggish maneuverability, captains familiar with Colorado's play style will be right at home using W. Virginia 1941. W. Virginia 1941 is placed at Tier VI, and as such has a few differences from her sister at Tier VII. She has a difference of 9,100 hit points, and almost 3 kilometers less range. She does however possess a faster rudder shift time. Her anti-aircraft firepower is also significantly worse than that of Colorado, and even worse than that of Arizona. Like her sister, W. Virginia 1941 excels at mid- and close-range engagements with her enemies. Her large, accurate guns are devastating against cruisers and battleships alike, and her thick armor, when angle properly, keeps her safe from being citadelled by enemy armor piercing ammunition, although guns of 356 mm or larger will still get overmatch penetration damage on her 25mm plating. She is quite vulnerable to high explosive shells, especially those found on higher tier cruisers and destroyers. Her slow speed and short range requires captains to have a good grasp of positioning and map layouts to reach engagements in a safe and timely fashion. Captains should be wary of over extending, as her speed will prevent her from withdrawing safely. When top tier, W. Virginia 1941 can easily lead a push; when up-tiered, W. Virginia 1941 is best played as a mid-range support ship. Captains who have experience playing Colorado — or any of the American battleships from Tier VII and below — should have no problems playing W. Virginia 1941. She offers players something different than Arizona: fewer shells, but more punch. Tied strongest gun armament of Tier VI battleships with Mutsu. Durable armor against guns of 15-inches or less, due to the all-or-nothing armor scheme. Low citadel, and well protected making citadel hits uncommon. Good turning radius, for a battleship. Low top speed at 21 knots. This is typical among U.S battleships of the era, but makes re-positioning W. Virginia 1941 a painful exercise. Weak AA, inferior (albeit very slightly) even to that of the Arizona; however, it's better than Normandie. Covered extensively by 25mm plating, leaving West Virginia to be very vulnerable to HE spam and overmatch from guns larger than 356mm. This typical with most Tier VI ships and similar to some Tier VII. Inferior detection radius compared to other Tier VI American battleships. Without Artillery Plotting Room Modification 1 ( ), she has inferior main gun range to some of her counterparts at Tier VI; however, her range is still comparable to Arizona, Warspite, and New Mexico, and further than stock Bayern and Queen Elizabeth. As a premium ship, W. Virginia 1941 doesn't have any upgrades to research. Key skills for W. Virginia 1941 commanders include Priority Target, Expert Marksman, Superintendent, and Fire Prevention. As a premium ship, W. Virginia 1941 comes included with Type 9 camouflage that lowers her detection radius, reduces the accuracy of incoming shells, reduces her repair costs, and increases the amount of experience she earns. W. Virginia 1941 captains should mount standard signal flags to improve the ship's performance in battle. Sierra Mike ( ) flags are recommended to increase the ship's top speed. India Delta ( ) and India Yankee ( ) flags should be mounted to improve the ship's survivability. November Foxtrot ( ) flags can also be mounted to decrease consumable cooldown time. Lastly, economic and special signal flags can be mounted to increase the ship's economic gains per battle. USS West Virginia sailing past Hawaii, 1935. The Colorado-class battleships were in most ways repeats of the preceding Tennessee-class, with the larger main battery guns. In 1916 the US Navy ordered a class of four new battleships, which would be an improvement in firepower over the older classes while keeping the characteristics of the Tennesee hull. This order included sixteen ships of various classes and types, however only the three ships of the Colorado-class would be completed as the ships they were intended to be. Aside from two Lexington-class ships, which would be converted into aircraft carriers however. Under the Washington Naval Treaty, the ships of the Colorado-class were included in the “Big Seven”: the seven battleships across all navies permitted to carry guns of a caliber of 406-410mm. The other four ships were HMS Nelson and HMS Rodney, and the Japanese Nagato and Mutsu. With a 190.2 meter long and 29.7 meter wide hull, the compact design of the standard-type battleships was continued. The maximum displacement reached 40,400 tons when fully loaded, and the draft increased to 10.8 meters. With eight boilers producing steam for two turbo generators, these ships could reach 21 knots at a power output of 28,900 shaft horsepower on each of four shafts. Fuel supplies on board would permit a cruising range of up to 9,700 nautical miles. The protection scheme was a continuation of the all-or-nothing scheme, which placed a lot of emphasis on protecting the vital compartments and main armament of the ship, while leaving the rest of the ship mostly unprotected. The main belt was 343mm thick, and would thin down to 203mm at its lower edge. The forward and rear bulkhead were protected by 343mm of armor. At the upper edge of the armored belt the main armor deck started, and would cover the entire machinery and magazines with a thickness of 89mm. The barbettes for the main battery turrets were 320mm thick, and the turrets themselves had 457mm faces, 229-254mm sides and a 127mm strong roof. The conning tower had 406mm sides and a 203mm strong roof. The main battery was carried in four twin turrets of 406mm (16-inch) guns. The secondary armament at completion consisted of twelve to fourteen (Maryland carried the higher number) single mounted 127mm guns, and four or eight (Maryland packing the lower number) 76.2mm guns which would also be able to engage aircraft. Two underwater torpedo tubes were installed, and would later be removed during refits. As with most ships of the era, the anti-aircraft armament was later deemed insufficient, and various modernizations would address that issue. These would result in Colorado carrying eight single mounted 127mm/25 guns, while her two classmates would receive eight 127mm/38 twins in enclosed turrets. Up to fifty-two (52) barrels of 40mm Bofors in quad and twin mounts, plus as many as sixty-four (64) 20mm Oerlikons in single, twin or even quad mountings would find themselves installed aboard the ships of the class. In the late 1920s, all three ships received at least one aircraft catapult and the ability to carry up to three seaplanes. 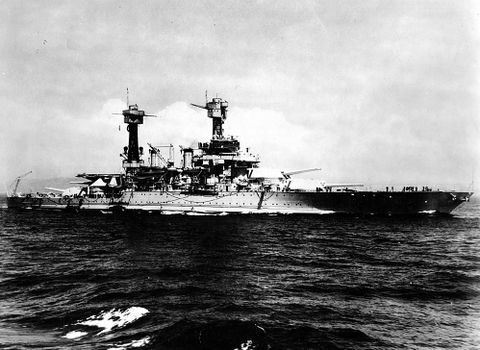 Laid down on 12 April 1920 at Newport News, Virginia, launched on 19 November 1921, and commissioned into the United States Navy as the final “standard-type battleship” on 1 December 1923, USS West Virginia (BB-48) would be the last American battleship commissioned into the USN until USS North Carolina (BB-55) joined the Navy 18 years later. In her early life, West Virginia suffered technological issues that lead to her becoming grounded in the Lynnhaven Channel when her engine room lost power. Once these issues were resolved, West Virginia became the flagship of the United States Navy in October 1924. West Virginia was present in every annual ‘Fleet Problem’ (military exercises carried out by the USN) from 1925 through to mid-1940, while participating in several goodwill voyages across the Pacific. In the final months of 1941, West Virginia underwent intensive training alongside the fleet based out of Pearl Harbor, Hawaii. She was moored at Berth F-6 when Japanese planes crossed the horizon on 7 December 1941. The first wave of Japanese planes struck West Virginia hard. Seven aerial torpedoes struck her port side at a shallow depth: one dislodged her rudder; several others struck her belt and tore holes in her side; others exploded inside her armored second deck by entering the holes torn by previous torpedoes. Two improvised armor-piercing bombs made from 16” AP shells fitted with aerial fins struck her deck and destroyed her floatplane and penetrated the roof of Turret #3, but neither detonated. Her port side filled with seawater, and her crew raced to counter-flood her starboard side to prevent her from capsizing in the harbor. Fires from USS Arizona (BB-39) spread to West Virginia’s upper decks. Her captain, Captain Mervyn S. Bennion, was mortally wounded on the bridge but continued to give orders to keep his ship from sinking. The ship’s executive officer abandoned ship during the first attack, and Lt. Commander John S. Harper took over as commanding officer. He countermanded the captain’s dying order for all hands to abandon ship, ordering repair parties to fight the fires broken out on her decks. By the end of the day, West Virginia was a half-sunken wreck, but she was not lost. Six months later, repairs to West Virginia were underway. A patch was applied to her hull, the water pumped out and the ship refloated, and she was moved to drydock Number One in June 1942. Despite the monumental task of repairing the serious damage to her port side, West Virginia sailed under her own steam from Pearl Harbor to the Puget Sound Navy Yard in Washington State for a complete rebuild. She remained in the Navy Yard until mid-1944, when her extensive refit and repairs were complete. She returned to Pearl Harbor in late September 1944, then sailed to Manus Island to join up with — and become the flagship of — Battleship Division 4. The division sailed north to join Task Force Group 77.2, and participated in the Invasion of the Philippines. West Virginia had sat idly by long enough; crippled the moment the war began, she could finally avenge herself at last. West Virginia provided gunnery support for the initial landing forces, silencing Japanese coastal installations with her 16” and modern 5” guns. Her first real engagement came when the Imperial Japanese Navy attempted to repulse the Phillipine invasion forces. At 03:16 in the early morning of 25 October 1944, West Virginia’s radar picked up a Japanese fleet, with West Virginia herself leading a battle line of five other ‘standard-type’ battleships. This engagement would come to be the Battle of Surigao Strait, the second and last battleship-versus-battleship engagement in the Pacific War, and the last such engagement in history. The Japanese fleet under Admiral Shoji Nishimura consisted of the battleships Fuso and Yamashiro, the heavy cruiser Mogami, and four destroyers. The seven ships sailed into a deadly trap of half a dozen US battleships – led by West Virginia – supported by eight cruisers and over 60 smaller combat vessels. West Virginia opened fire with her eight 16” guns at 3:52 am at a distance of nearly 21km, with her first salvo striking true on Yamashiro. Her sixteen salvos fired as she crossed the "T" of the surviving Japanese fleet utterly decimated it, with the battle between battleships being over just over 20 minutes after it begun. She returned to Vanuatu for repairs on 29 October. She returned to the Philippines in late November, resuming patrols in Leyte Gulf to screen against enemy aircraft, where she had her first encounters with kamikaze aircraft. West Virginia herself avoided being struck, but she recovered survivors from vessels sunk by such attacks during her tenure that continued into early 1945. On the 17 February 1945, she sailed to assist US Marines in the attack on the Japanese island fortress of Iwo Jima. She joined the ring of ships surrounding the island on the 19th, and opened fire with her 16” guns, wreaking havoc on the Japanese island garrison. She departed for the Caroline Islands on 4 March, although the fighting on the island continued until the end of the month. Her next deployment was to Okinawa, arriving off the coast of the island on 25 March, where she began to bombard the shoreline ahead of the American landings planned for 1 April. On that date, West Virginia was struck by a kamikaze which crashed into her superstructure, killing or wounding almost 30 men, but the damage was reported as “fixable” and she carried on. By 8 April, West Virginia was prowling the waters in preparation to intercept Japanese superbattleship Yamato, which was headed to Okinawa on a suicide mission. That morning, West Virginia received news that Yamato had been sunk by US aircraft. West Virginia remained off the coast of Okinawa until the Japanese government agreed to surrender on 10 August. She sailed to Tokyo Bay on 24 August, and was present on 2 September for the signature of the formal surrender. She remained in Tokyo Bay until mid-September, then returned to the US West Coast via Okinawa, Pearl Harbor (where she received a fresh coat of paint), and then on to San Diego, California. She arrived at her destination on 22 October 1945 to take part in Navy Day, where over 25,000 visitors boarded the ship. After the celebrations, she did three runs between Pearl Harbor and the West Coast as a part of Operation Magic Carpet, disembarking her final load of passengers over Christmas in San Pedro. Afterwards, she sailed north to Washington state, arriving in Seattle on 16 January 1946, where she was moored alongside her sister ship Colorado. She was decommissioned a year later, becoming part of the Pacific Reserve Fleet. She remained in reserve status until March 1959, when West Virginia — alongside many WW2-era vessels — ere sold to the scrappers, slowly disappearing from the world piece-by-piece. Dazzle camouflage resembles the Measure 32/7D scheme, which was actually applied to West Virginia after her reconstruction in 1944. Overall sea blue hull is missing. A similar paint scheme can be found on Arizona. USS West Virginia (BB-48) in San Francisco Bay, c. 1934. West Virginia after her reconstruction at Puget Sound, Bremerton WA, 1944. West Virginia from the bow at Puget Sound, 1944. A pic of USS Maryland (BB-46) from under West Virginia's rear guns. This page was last modified on 27 February 2019, at 21:59.